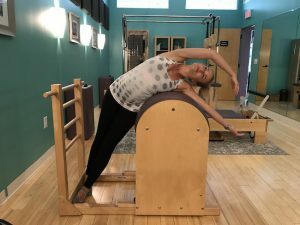 Benefits: This stretch not only feels ahhhhhhh-mazing, but provides the spine with lateral flexion and allows for a deep stretch of the intercostalmuscles. The intercostal muscles, or your ribcage muscles, help expand and shrink the chest cavity to facilitate breathing. As baby grows and encroaches on this area, it is important to keep these muscles stretched to avoid pain and allow for deeper breathing. 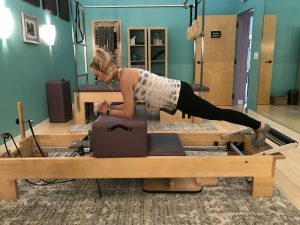 Benefits: This exercise is excellent for building and maintaining strength in the transverse abdominis (your deepest layer of core muscles or your body’s internal corset) and pelvic floor muscles. These muscles are crucial for effective pushing during labor and can help prevent incontinence and speed postnatal recovery. Caution: Make sure planks are being performed with proper body mechanics, pulling abdominal wall up, in and together. The low back should never feel strained while planking. If low back pain is present, the abdominal muscles aren’t being engaged properly or not strong enough to support proper plank form. If discomfort persists, discontinue planking and use other pregnancy appropriate exercises to strengthen the core, such as pelvic tils (see below). 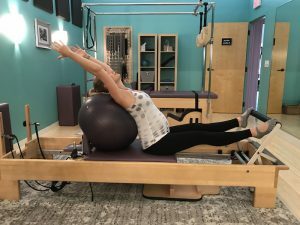 Benefits: This feel good exercise is a fantastic way to incorporate thoracic extension in a controlled and safe range of motion. As the belly and chest grow larger during the second trimester, they cause the upper back to round forward and the chest to tighten and close off. Exercises that allow the thoracic spine to extend are important during the second and third trimester to combat and overly rounded forward posture in the upper body. Caution: If diastasis recti is already present due to a previous pregnancy(s), avoid thoracic extension, as this range of motion could cause the abdominal wall to separate even further. Benefits: This exercise mobilizes the pelvis while strengthening and stretching the pelvic floor. During labor the pelvic floor muscles must be strong enough to push, but flexible enough to allow the baby to move through the birth canal. This is a must do exercise throughout the second and third trimester, as we prepare the body to give birth. Benefits: This exercise strengthens the outer thighs and glutes to help stabilize the pelvis. Due to the hormone, relaxin, that runs through the body during pregnancy, the joints and ligaments (especially in the pelvis) become soft and unstable. Strengthening the glute and hip muscles helps to stabilize these joints, decreasing hip pain and improving endurance for labor.